Why did you study Zoology? I love animals, and I had heard about UQ’s reputation for excellent courses related to animal studies. What was the best part of your studies? I enjoyed having the opportunity to do field work during my degree. This set me up with some practical experience as well as the knowledge to gain a job in my chosen profession. What kind of work do you do as part of your job? 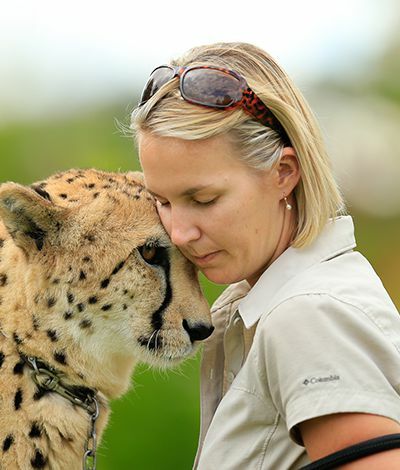 I work on the carnivore section at Auckland Zoo, looking after lions, tigers, cheetah, serval, Tasmanian devils, otters, red pandas, meerkats and porcupine. I am responsible for the daily husbandry of these animals as well as the upkeep of their enclosures. My job also involves educating visitors to the zoo about the animals in my care. I love working with such amazing animals and having the opportunity to educate people about them. My favourite part of my job is training and conditioning with our animals, this makes husbandry and vet procedures less stressful for them. I enjoy being involved in the conservation work of both local and international species.